Chicken: Hen (female chicken) is tougher and tastier than cockerel (male chicken) so when you go to buy chicken, ask your grocer or meat seller for the hen. This is called Gallina in Spanish. You should also buy a whole chicken and cut it up in pieces. Not only is it cheaper but you get the different parts of the chicken which adds to the flavour rather than just one part. Onions: White, yellow or red onions. Onions are very important when seasoning chicken. Thyme: This is very essential due to the aroma it adds to the chicken. Stock cubes: Maggi or Knorr are the brands that bring out the best taste in Nigerian recipes. Salt: Use salt sparingly when seasoning your chicken. Salt should be added when the chicken is done. Never add salt to raw chicken, see notes below for more information on what adding salt too early does to your chicken or beef. Switch your oven to "Grill" or if you are in the USA, "Broil" and set the temperature to 170°C or 338°F. I do not use Nigerian curry powder to season my chicken simply because it changes the colour of the chicken and gives it an artificial overpowering taste. You can add curry powder to stews that you use the chicken or beef for. But if you don't mind the colour and taste it gives the chicken, feel free to add it when steaming the beef or chicken. Serve with all the Nigerian Rice recipes, Nigerian Moi Moi and Nigerian Salad. Feel free to snack on it with a chilled drink. Your guests will love you if you serve them grilled chicken. 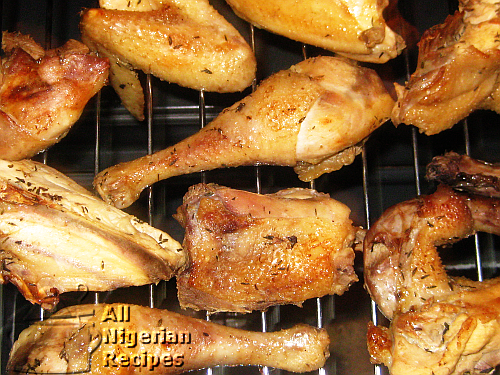 The following video details the process of grilling chicken.